Making a pork pie in a loaf tin is so much easier than using the hand-raised technique. Serve in slices at picnics and barbecues. 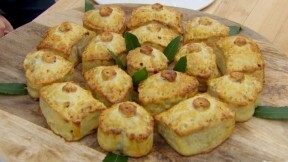 This spiced pork pie with cranberries recipe is featured in Season 4, Episode 8. Grease a 900g (2lb loaf) tin with oil or lard and line with baking paper. For the filling, tip all the ingredients into a large mixing bowl apart from the chicken. Mix together using your hands until well incorporated. Season generously with salt and pepper. Take a teaspoon of the mixture and fry until cooked. Taste to check the seasoning and add more salt and pepper if necessary. For the pastry, put 200ml (7fl oz) water and the lard in a saucepan. Heat until the lard is melted, then bring to the boil. Put the flour and salt in a large mixing bowl, pour in the melted lard mixture and stir well to combine using a wooden spoon. When cool enough to handle, knead in the bowl to form a smooth dough. Set aside a quarter of the dough and wrap in cling film. On a lightly floured work surface, roll out the remaining dough to about 1cm/½in thick. Use this to line the loaf tin, making sure that any tears or gaps in the pastry are filled. Roll out the reserved pastry to make the pie lid. Fill the tin with alternating layers of the sausagemeat mixture and chicken slices. Cover with the lid and pinch the edges to seal. Cut off any excess pastry and make a hole in the middle of the lid using a sharp knife. Brush the top of the pie with egg wash and bake for 1 hour 15–20 minutes. The pies are cooked when the centre of the meat filling reaches 165F on a meat thermometer and the pastry is deep, golden-brown. Leave to cool completely in the tin. For this recipe you will need a 900g (2lb) loaf tin. Note: This recipe contains U.K. measurements and may require conversions to U.S. measurements. It has also not been professionally tested.